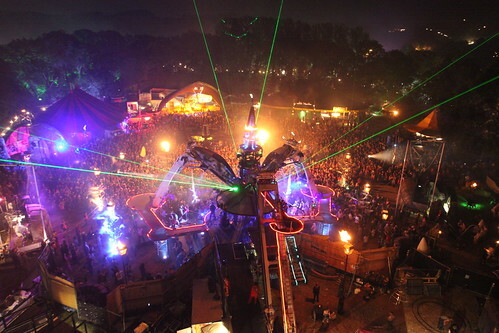 GlastoEarth catches up with Arcadia, and they reveal their 2011 lineup. It’s been a dizzying few years for Arcadia at Glastonbury. It seems like only yesterday that they were squeezed into someone else’s field, with a few of those magnificent lamposts and a stage fashioned out of little more than a skip full of scrap goodies. By 2010, their concoction of metal paraphernalia became a towering spider. It shot flames, fired lasers, and hoofed a knock out punch through a state of the art Funktion One sound rig. If that wasn’t enough - and it surely would have been - out came The Lords of Lightening. 6 foot arcs of millions of volts. The crowd were transfixed. Some were in disbelief. “It’s done with holograms”, one festival goer was overheard saying. Arcadia had reached a point where, for some, what they were seeing wasn’t just mind blowing - it was impossible. And so to 2011. For many a glasto goer (and the sales team at Calor Gas) it’s the most anticipated spectacle of the year. Speaking from Worthy Farm today, Pip Rush explained the journey. “Earlier in the year, we found two directors. One with a theatrical background, and another with experience of circus style performances. Ryan from Bassline Circus has been giving us input, but...it’s a collaborative thing... lots of people have the ideas. It’s constantly evolving”. If there’s something else that’s quite special, it’s Arcadia’s relentless drive to get one up on their previous outing. 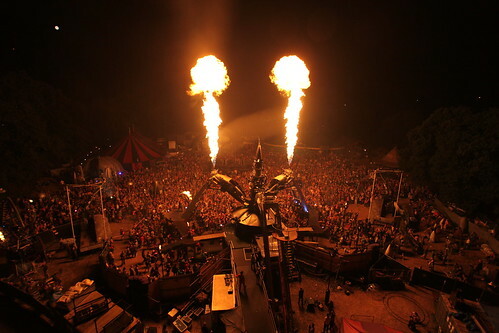 But just how can they top the epic tesla-coil powered Lords of Lightning podium performance of 2010? “We’re working with the Lords of Lightning again, but pushing the boundaries of what can be done with Tesla coils. I can’t say too much... if only because we don’t yet know if what we’re thinking is even possible. It’s unresearched physics.” Gulp. If there’s one thing that’s nailed on though, it’s the return to a 360 degree stage. “Last year it was a struggle, because we had a stage that was designed to work from all sides, but we could only run at 180 degrees.” Their move this year, into one of the largest late area fields, combined with some novel engineering, will bring back the original Arcadia experience. No wall, no ‘them and us’ divide - a philosophy the team bring that belies their background in the free party scene. I leave Pip to get on with the build, and collar his partner in crime, Bertie Cole, to talk about the line up. In 2010, Arcadia moved away from being pure beats, bringing a broader spread of styles to their stage. “It’s something we’re doing again this year, and on Saturday we’re also throwing more experimental things in... psychedelic...”, a nod, in part no doubt, to Monk3y Logic who take the sunset slot on Saturday. Bertie’s in full flow. Enthusing about new talent... “Gentleman’s Dub Club, they’re young and up and coming, and they’re really smashing it up”, and also giving more than just a nod to old hands, “Neville Staples of the Specials, that’ll be massive”. It is however, to the Saturday night headliner where all eyes turn. Orbital, performing a DJ set. Just how did that end up happening? With the Arcadia top level booth being so small, will the brothers be doing their set from the stage? “Yes... and the stage will revolve”. Blimey. So we’ll all get a good view of those famous glasses then. If God is a DJ, Arcadia have built the temple.